The next time you’re wandering through a Costco, don’t roll your eyes at the giant barrels of glowing orange cheese balls, wondering why anyone would buy such a thing. Because this is why you’d buy it: to build yourself a cheese ball-blasting machine gun that will revolutionize snacking as we know it. This wonderful creation is the work of YouTube’s NightHawkInLight who built it using a giant tub of cheese balls, some run-of-the-mill plastic PVC piping, and a leaf blower providing the power. 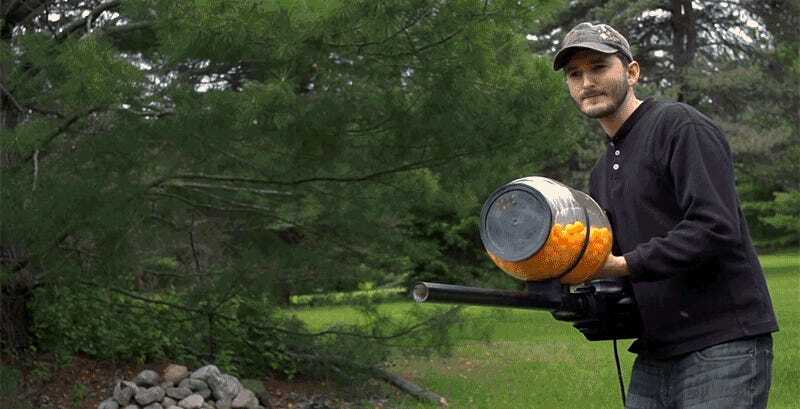 It can hurl those lightweight cheese balls at an impressive speed, and similar to a paint ball, the cannon’s ammo will leave bright orange powder stains on whatever it hits—minus the painful bruising.